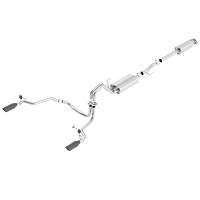 The 2015-2019 2.7L and 3.5L EcoBoost F150s may be packing quite a bit of horsepower and torque under their hoods, but they aren't making much more than a kitten purr out their tailpipes with the factory cat-back exhaust kit. 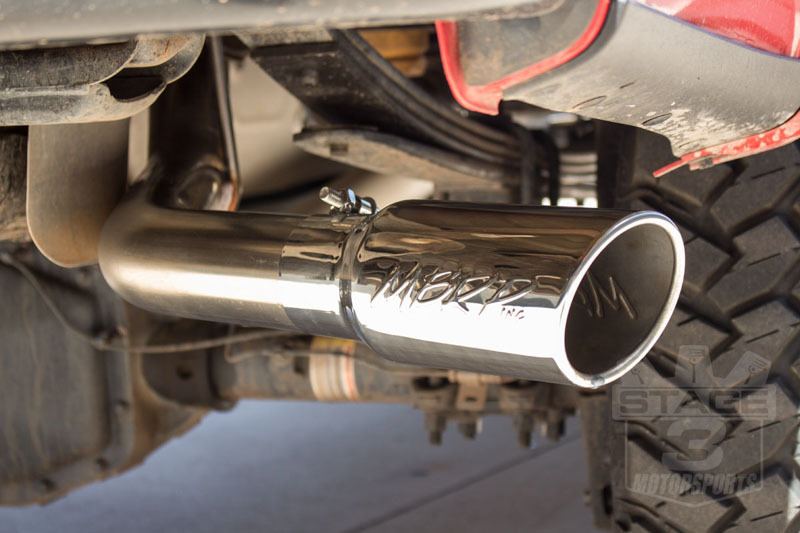 MBRP wasn't much of a fan of the factory exhaust note either, which is why they've put together this 3" Installer Series Cat-Back System for your 2015-2019 F150 EcoBoost. 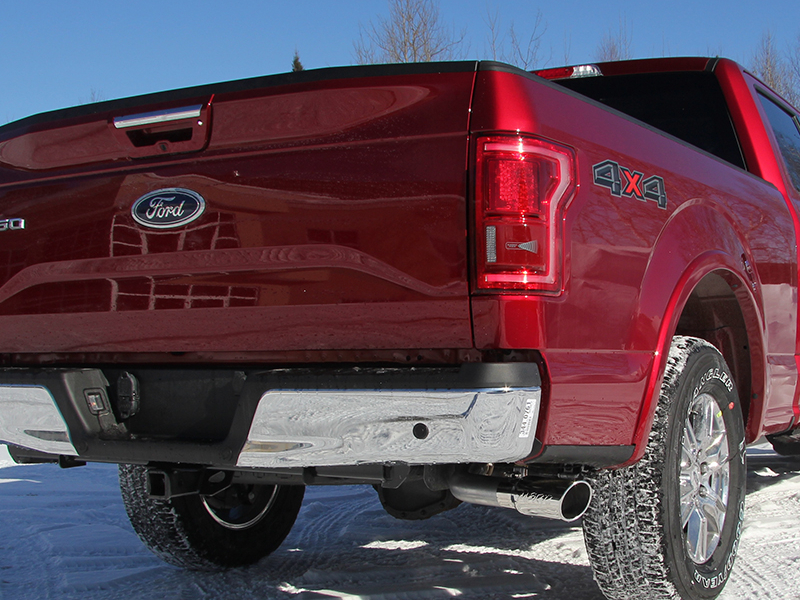 MBRP's cat-back kit gives your truck an aggressive new sound and features an OE-style single side exit configuration that keeps your truck looking clean and mean. The kit is an excellent way to get a much more noticeable and awesome sound of your truck without changing its factory good looks. The Installer Series cat-back kit bolts on right in place of your truck's stock cat-back and will only require minor cutting on some wheelbase sizes. 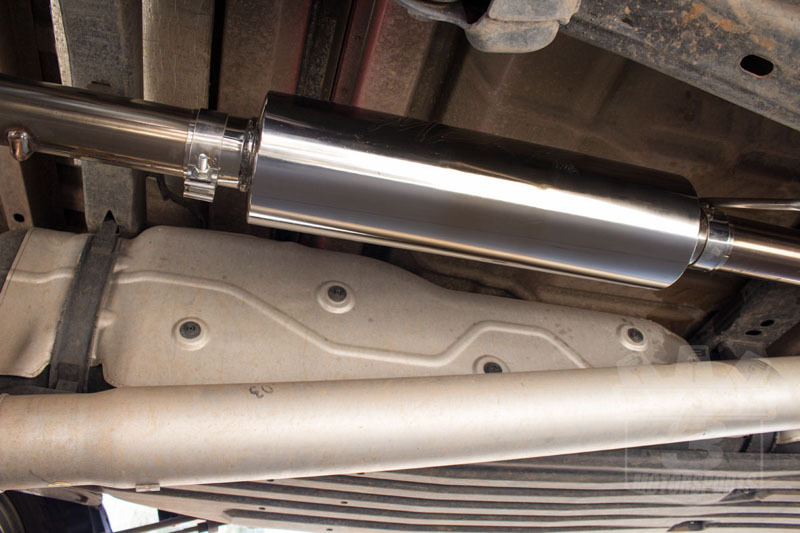 The MBRP 3" Single-Side Exit Kit was carefully designed by MBRP to give your truck a great, deep sound while fitting your truck perfectly. The kit is built around 3" diameter, mandrel-bent tubing from the mid-pipe flange all the way back to its tip and features a muffler that adds a deep rumble to your 2015-2019 F150 without causing a ton of cabin drone at idle or cruising speeds. The kit exits in the factory location behind the passenger side rear tire and is topped off by a 3-1/2" diameter exhaust tip with the MBRP logo. The Installer Series system is made out of low-cost aluminized steel and comes with all its necessary installation hardware and instructions. F150 wheelbase fitment: This cat-back kit will fit all 2015-2019 wheelbases, though some minor cutting is required for some cab and bed configurations. I don't review too many things but this purchase had so much good and so much bad I had to say something. First, MBRP's packing of this product was pitiful. Couple squirts of foam at each end which held the bigger pieces in place but the muffler arrived bent on both the female and male lands. 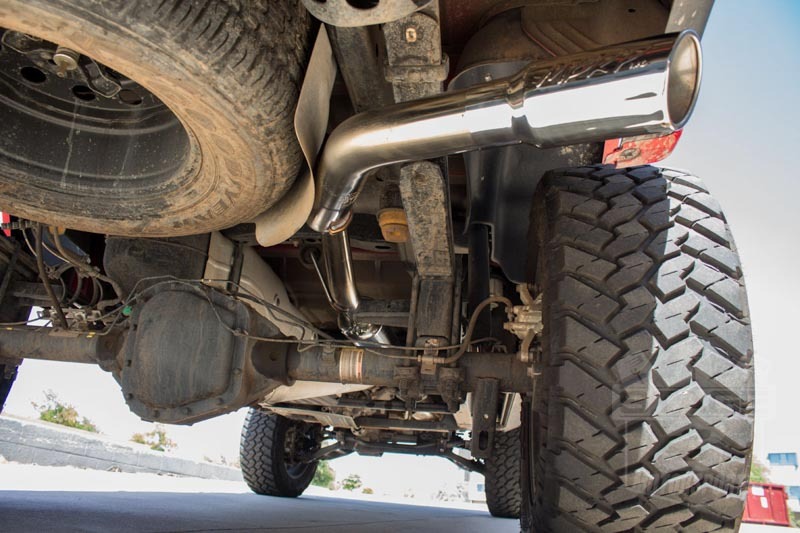 Totally unacceptable and leave it to Mr. Overanxious to not realize it until the old exhaust had been completely removed. It was so badly bent on the female side that I had to cut slots in the male section to make it fit. Second, I suggest that you won't be able to be a backyard mechanic and put this system in while the truck is on the ground. The only way to work the old muffler out because of its size and weight is with the suspension dropped while the frame is jacked up. 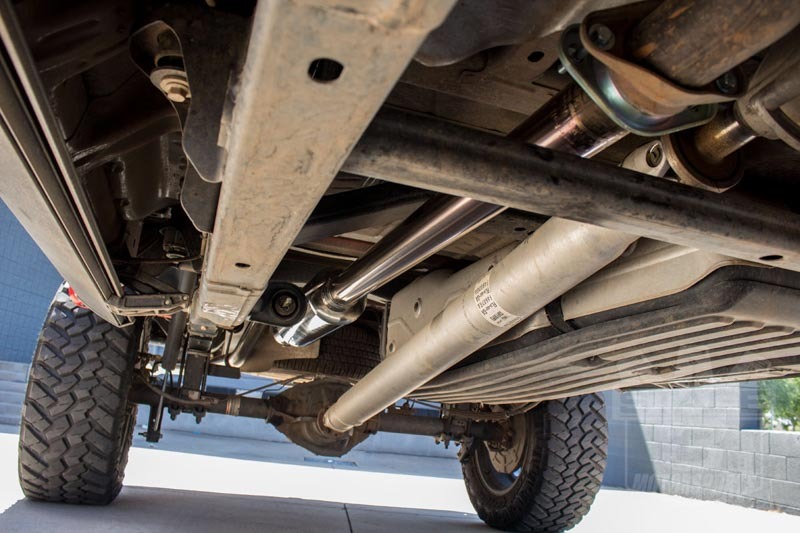 Also save yourself some time and remove the back two hangers completely with the old muffler and then reinstall them before you put in your new MBRP. Hangers are easier to work with if you spray them down with penetrating lube. Fit on joints is really tight so it's hard to twist the pieces while they're put together. As stinky as it was for a while I put some squirts of WD-40 between the joints for easier manipulation. It took some time but fit was perfect under the truck even though it was like a jigsaw puzzle, you can get good clearance between the tail pipe and the spare tire carrier, it just took some patience. Third, my afterthoughts, sound is much better than stock, how could it not be, I'm use'ta V8's with glass packs so you can understand my slight disappointment, it's not very throaty. It doesn't drone at highway speeds and sounds OK on launch. Friends say it sounds like a Singer sewing machine on steroids or a mini Cooper with big tires, LOL boys. There is noticeable increase in throttle response but no real change in gas mileage. My 2 temperature tests though not truly scientific (different ambient temps) show about 75-90 degree difference 6' behind the muffler, that to me is significant. I'd say over all great addition to my truck. This is exhaust is everything you could ask for for the price. Install took about 2 hours after the stock exhaust was removed. I recommend getting your truck up as high as possible because the piping near the rear axle is a pain to try and maneuver out of there. The install would have gone by much faster and smoother if I didn't have to bend some of the inlets to make the piping fit. Using a mallet I just knocked out some of the curvature in the inlets and the pipes slid right in like they should. This modification is the only reason I did not give this the full 5 stars. 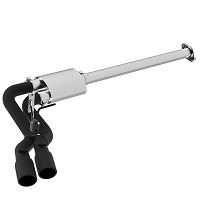 But, for a sub $400 exhaust, this kit is pretty awesome. It sounds great!It obviously does not sound like a V8 but it does sound much closer to the power-plant it is rather than the church mouse it is from the factory. The tone is pretty deep and aggressive under throttle and it is almost unnoticeable at idle and slow speeds which is exactly what I was looking for. You do notice it a little exhaust noise on the highway but definitely little to no drone which is awesome. Overall very happy with the product, and of course Stage 3's customer service! Total garbage. It was easy to install . Bit what they don't tell you is that you can Barely hear yourself think with it. It is so load inside the cab . Great quality kit, great price from Stage 3! Fit was perfect, I weld all the fittings so the finish is better then the clamps. It's quiet durning normal driving and loud when you step on it! I bought this worried about quality and sound but sounds great not too loud. Opened my truck up a lot. Went very smooth. Took an hour to take my exhaust off and put this one on. The tip looks great too. Install is as said above. I cut my own pipe just after the muffler to make it easier. 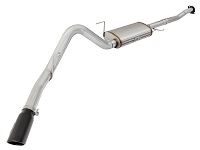 I have the stainless works off-road downpipe and with this exhaust, my truck is unbearable. The drone is deafening. 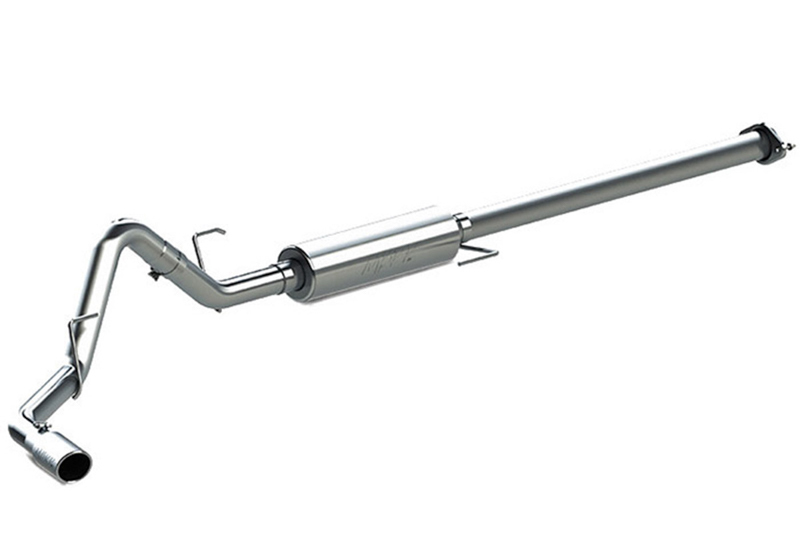 I called MBRP and they said they could sell me a quieter muffler. When I got it, it was the exact same as the one I had and I called to verify that it was different. They said the internals were different. I installed it and it was the same and now I have two crappy mufflers because since I installed it and ran it they won't take it back. So they sent me the biggest resonator they had(26'). I installed it and the ride through the neighborhood is quieter, but at highway speeds the drone is just slightly better. I used a decibel meter to confirm. The initial cat back was 85dbs and with the resonator it was 80dbs. As a daily it's unacceptable. I have earplugs now. I should've kept my stock exhaust. Thanks. Also don't go by internet videos for choosing your exhaust, they don't tell the whole story. This kit is only on sale through Cyber Monday. For the latest stocking information and availability, please call us directly at 623-434-5277.